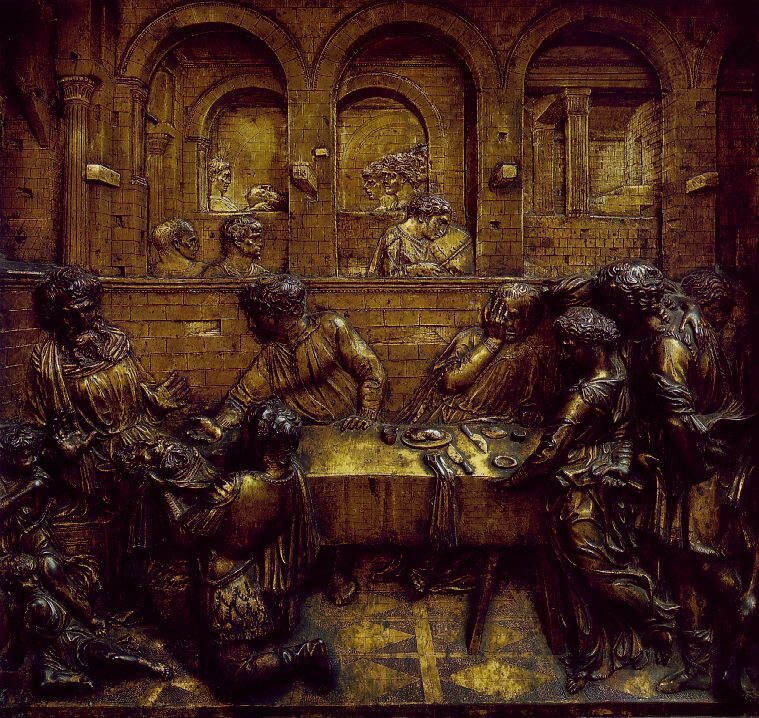 The Feast of Herod by Donatello is a relief sculpture made of bronze that was created around 1427. It is currently on display in the Siena Cathedral in Italy. Donatello was asked to make this relief for a font at Sienna, which is where it is still housed. The use of perspective is what made this piece of art so popular over the many years it has been on display. The piece depicts a part of the life of St. John the Baptist. In the sculpture there are several people sitting around a table, including Salome and Herod. Salome requests Herod to bring the head of St. John the Baptist, which he brings back on a platter. He presents the severed head while kneeling down to Salome. Herod is looking down at the head, apparently in shock and horror over what is in front of him. Since this is a relief sculpture, it is raised from bronze and has meticulous detail.